Credit: Dr. Oliver Konter, Mainz. Beyond the ambit of fascinating historical legacy, Greece is also home to Europe’s oldest living inhabitant. Located in the highlands of Northern Greece, a Bosnian pine specimen (Pinus heldreichii) was found to be more than 1,075 years old. The incredible discovery was made by the collaborative effort of researchers from Stockholm University, the University of Mainz and the University of Arizona. It is quite remarkable that this large, complex and impressive organism has survived so long in such an inhospitable environment, in a land that has been civilized for over 3000 years. Many years ago I read a thesis about this very interesting forest in Greece. In our research, we try to build long chronologies to construct climate histories, so finding living trees of old age is one of our motivations. To age the tree, we needed to take a core of wood, from the outside to the center. The core is one meter and has 1075 annual rings. 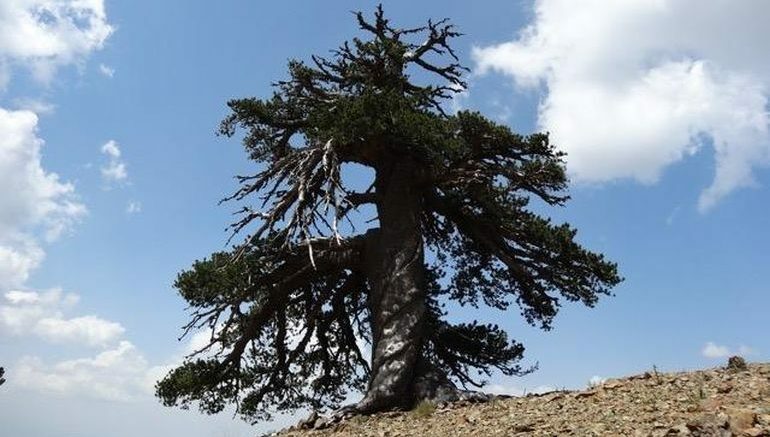 Interestingly enough, this specimen of Bosnian pine, affectionately named as ‘Adonis’ (after the Greek god), is one among more than a dozen specimens of millennial age, all found in the treeline situated atop the Pindos Mountains. To that end, the researchers are looking forth to study and analyse the variations in tree rings from these similar organisms, ranging from the living ones to the fallen (yet ground-preserved) ones. The assessments could shed new light on the informative history of climatic and environmental conditions that harks back to at least thousand years ago. 941 – Adonis is a seedling. The Byzantine Empire is at its peak. From the North, the Vikings reach the Black Sea. 1041 – Adonis is a 100 years old. In China, a book is published describing gunpowder. A man called Macbeth is crowned King of Scotland. 1191 – Adonis is 250 years old. The universities of Oxford and Paris are founded. The third crusade battles Saladin in the Holy Land. 1441 – Adonis is 500 years old. The Ottoman empire conquers Greece. Many Greek scholars flee to the west, influencing the Renaissance. In Sweden, the first parliament is held in Arboga. Johannes Gutenberg is about to test his first printing press. 1691 – Adonis is 750 years old. Isaac Newton has formulated his Laws on Motion. Ice cream, tea and coffee are introduced in Europe. 1941 – Adonis is a millennium old. World War II is ravaging the world. Greece is occupied by Nazi Germany, Italy and Bulgaria.